Answer: The Best Cooling and Heating units are efficient! One of the first things to consider when purchasing a new heating and cooling system is the S.E.E.R. rating. The Seasonal Energy Efficiency Rating (SEER) rating of a unit is the cooling output during a typical cooling-season divided by the total electric energy input during the same period. The higher the unit’s SEER rating the more energy efficient it is. High S.E.E.R. equipment operate and use minimal electricity to hold utility bills down. If you are replacing or considering a gas furnace, the Annual Fuel Utilization Efficiency (AFUE) rating is a percentage that measures the energy efficiency of a gas furnace. The number comes from how much heat a furnace is able to produce in relation to how much energy it consumes. For example, if a furnace has an 90% AFUE rating that means it converts 90 percent of the energy from its fuel into heat. Efficient units provide steady, dependable performance year after year when properly maintained. The best cooling and heating systems are quiet, long-lasting and low in service needs. Obviously, an air conditioner that’s too small won’t keep your home sufficiently cool and a furnace that is too small won’t sufficiently heat your home or business. But what many don’t realize is that an oversized system will short cycle (turn on and off) more than necessary, wasting expensive energy and possibly putting undue strain on the compressor or furnace heat exchanger. A qualified HVAC contractor will determine the optimum size for your home by making a careful study of your cooling requirements. Window dimensions and exposure, floor space, insulation and local climate, heat-generating appliances, the direction your home faces and even the amount of your home’s or business exterior shaded by trees should all be considered when your qualified HVAC contractor visits your home our business. 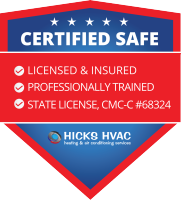 Your qualified HVAC contractor will specify the cooling capacity of the system in either Btu/h (British thermal units of heat removed per hour) or refrigeration tons (one ton being equal to 12,000 Btu/h). Today’s air conditioner manufacturers are required by law to evaluate and rate their equipment according to its energy efficiency. Most new homes with central air come equipped with a standard builder’s 14 S.E.E.R. Single stage of cooling model. However, when replacement becomes necessary, property owners can upgrade their air conditioning by specifying a more energy-efficient system with higher S.E.E.R. ratings, Multi-speed fan options, and two-stage compressor cooling options. The best air-conditioning systems will be 18-20 S.E.E.R. with variable speed compressors and motors. The Higher SEER models are generally more expensive, but can easily make up the difference by reducing your home energy bills up tp 50% depending on which option you decide. ← What Is The Best Energy Efficient Thermostat Program Strategy?